With just months to go until Sydney, Hyman was in the throes of self-doubt. Hyman, frustrated and overwhelmed with doubt, called her coach. “I’m ready to throw in the towel,” was her message. The underwater dolphin kick has always been a bit of a troublemaker in our sport. There was the duel between David Berkoff and Daichi Suzuki in the 100m backstroke at the 1988 Seoul Olympics, where both swimmers disappeared under the surface of the water for 30-35m on the first lap alone. The final was one of the big story-lines in the pool that week in Seoul, with spectators and viewers watching with bated breath as half the lanes churned with backstrokers while the other lanes looked eerily empty, their occupants meters below the surface kicking furiously. Denis Pankratov of Russia, another butterfly specialist who performed “extended breakouts” did so in an un-streamlined position, with his hands several inches apart, basically sculling. Pankratov powered to gold medals in the 100 and 200m butterfly at the 1996 Olympics in Atlanta. Other early pioneers included Sean Murphy of Canada and Mel Stewart and Jesse Vassallo of the United States. 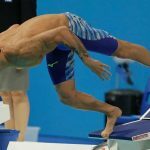 And of course, more recently there was the debate over the “Lochte rule”—whether a swimmer could push off on their back during freestyle events to perform fly kicks on their back before turning over onto their front. Hyman’s case was unique as her and her coach, Bob Gillett, had quite literally turned the novel concept of longer underwaters on its ear by having Hyman turn onto her side after diving in or pushing off. 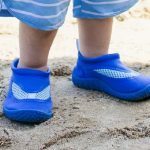 The idea was that the waves of the kick would reverberate off to the side (instead of hitting the bottom and surface). Fish kicking also tends to encourage a more balanced up-kick, which would ostensibly propel a faster kick. As simple as it might have been in theory, there was considerable risk to this style of kicking. For starters, swimmers don’t have the usual markers to guide them for going in a straight line. The black line is now to their peripheral. 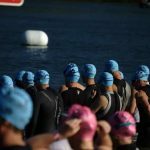 And of course, there is the very real concern of training yourself to be able to manage oxygen intake so that you can go without air for long stretches during a race. 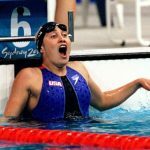 Since the rule change, Hyman had struggled to keep the pace, while also fighting the doubts of whether she could swim well enough to compete with the best swimmers on the planet. She’d always had difficulty bringing it home during her races, usually fading badly on the final lap. And now she would have to depend more on her swimming ability than her kick to get onto the podium. One of the big story-lines for the hometown Australians at the 2000 Olympics was Susie O’Neill. Earlier that year O’Neill had erased Mary T. Meagher’s storied world record in the 200m butterfly, a mark that had stood for nearly two decades. O’Neill was also the defending Olympic champion in the event. 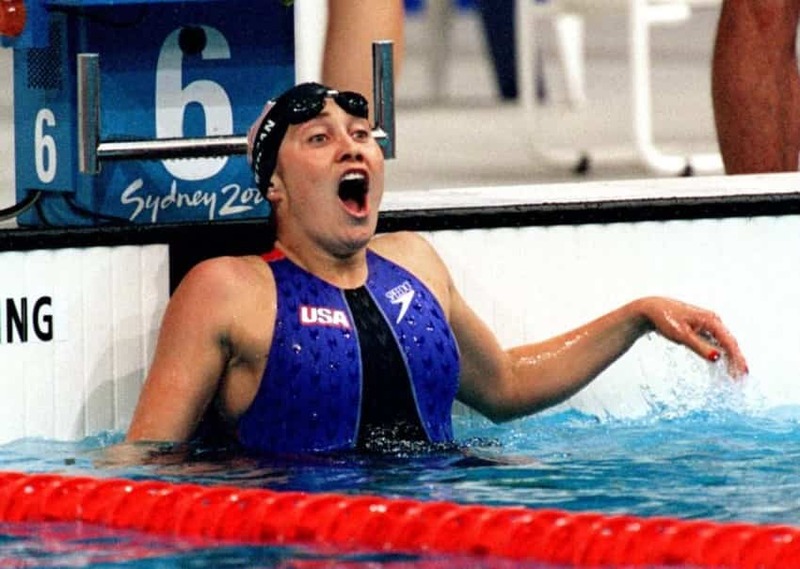 So when the finalists got up on the blocks for the 200m butterfly on the night of September 20, 2000, all eyes were on O’Neill and countrywoman Petra Thomas. Although she is last off the blocks, Hyman’s underwater fly kick give her a quick advantage when the swimmers surface. The body-length-off-the-start leads are a thing in the past, but Hyman’s dominance on the underwaters remains dangerous. Compared to O’Neill, who surfaces right away off the walls, her head breaking under the backstroke flags, Hyman kicks out to 10-12m, maintaining an early lead. When Hyman touches the wall at the 150m, O’Neill right on her, observers would have recognized this as the moment where O’Neill would take control. 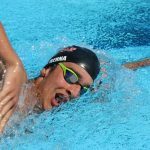 The Australian had a history of fast finishes, including in the final of the 200m butterfly in Perth, where O’Neill sailed past a fading Hyman to win comfortably. But the rule change has created an unexpected advantage for Hyman—she doesn’t create the same kind of fatigue that comes from holding her breath off the start and walls. Also, since the rule change, Hyman had worked diligently with her coaches to make her stroke more sustainable and efficient. Where the final lap would have been her weakness, in Sydney her lungs are fresh enough to power her home. This time, she doesn’t crumble coming down the stretch. Hyman touches first in a time of 2:05.88, just several hundredths of a second off O’Neill’s world mark. When she sees the scoreboard, Hyman erupts in joy. She is asked afterwards why she appears so stunned, so surprised by her win. 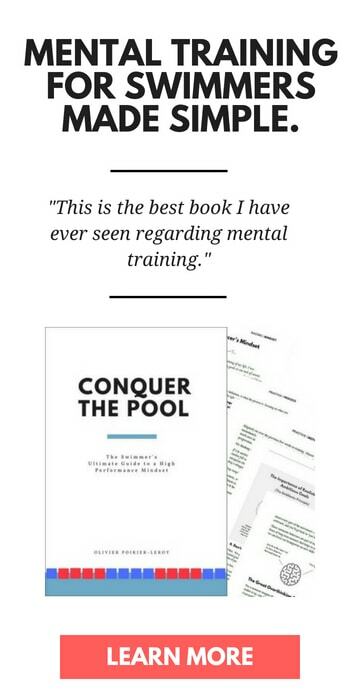 I hear a lot from swimmers who refer to adversity as something that is unfair or as something that proves they are not worthy. They don’t have the best facilities. 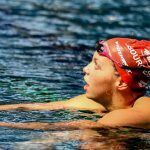 They lose to swimmers that they outwork in practice. They feel the deep frustration of not improving as fast as they want. But adversity doesn’t mean you are unworthy. Adversity is the opportunity to show how worthy you truly are. There are countless examples of top performers in our sport who have done the exact same thing. American Tom Dolan overcame asthma and a narrow windpipe to become an Olympic and world record holder in the 400m individual medley. Sprint champ Anthony Ervin was cut from the US 4x100m free relay going to finals, missing out on a chance to swim the final in Rio. 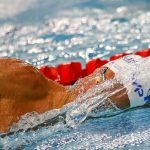 Lazslo Cseh becomes one of the best swimmers on the planet, but does so at the same time that Michael Phelps and Ryan Lochte are swimming at all-world levels. Natalie Coughlin getting past a crippling shoulder injury to become one of the most successful Olympians in history. Adversity, when you treat it as such, is the engine for improvement. It’s the moment where you realize you need to work harder. Or smarter. Or be more honest about how focused you are in practice. Adversity is a launch pad for better things. Even if you can’t immediately see what they are. Misty Hyman could have very well decided that throwing in the towel was the smart thing to do that spring before the Olympics. She’d spent years perfecting a kicking style only to see the advantage be wiped away. But in reality, that kick, the leg fitness, the breakouts, and the limitations imposed that allowed her to better oxygenate her muscles, turned out to be completely to her advantage. 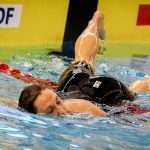 She’d also been forced to find a way to make her stroke more technically efficient so that she could close out the 200 butterfly with the world record holder. Although it seemed hilariously unfair at the time—the rule change was largely driven by her specific case—the “adversity” of the rule change actually worked to her favor. Something to think about the next time you find yourself face to face with some adversity that feels unfair and sucky. Olympic Champion Tom Dolan: Adversity is Confidence in Disguise. He became one of the greatest medley specialists in history on the back of exercise-induced asthma and a windpipe that made it difficult to breathe. Here’s another reminder that adversity can be your biggest tool for success.